In keeping with the Clark Lake tradition, the annual boat count took place on July 4, 2018. Surprisingly, the number of boats found on the lake declined by 10% from last year’s record count from 1653 to 1493. Rafts still dominate, but their numbers are down 4% from 607 to 580. Two more inboards were found on the lake, bringing the total to 88. There were two woodie’s–one at the Yacht Club, and the other, at the west end of the lake between Mud Point and the Township Park. People-power craft are down 13%, but at 396, the number beats most years. Sailboats are down 32%, but still ahead of the low point in 2013. Sailboats were at their zenith in the days of Fleet 58. In 1987, there were 252 sailboats on the lake. Boats moored at clubs increased by 8%, now at 406. Which club has the most is a statistical toss-up between the Beach and Boat Club and Eagle Point Marina. A new team took over the boat count this year. 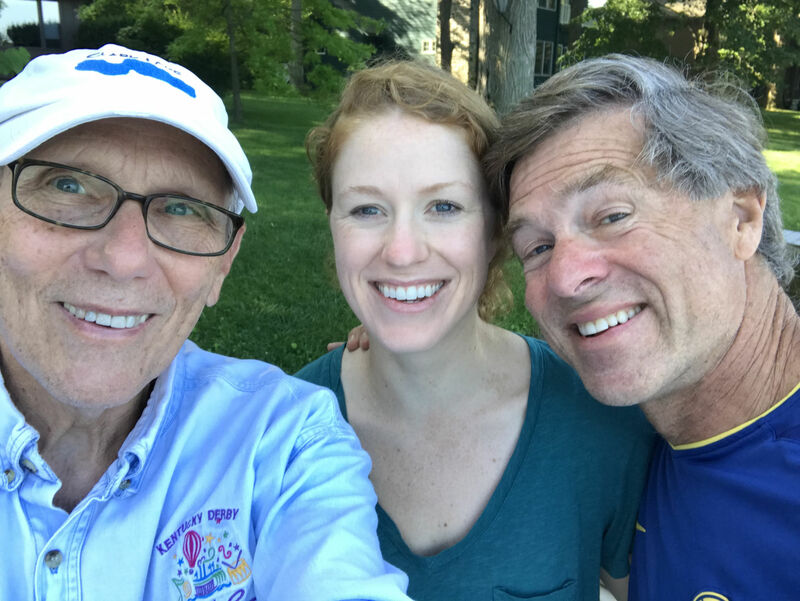 Terry Scott, and his daughter, Megen, are the new census takers. Rick Belcher is the one holdover from the last few years. Bill Tuttle, who recently moved to Ann Arbor, shepherded the count from 1987 through 2017. 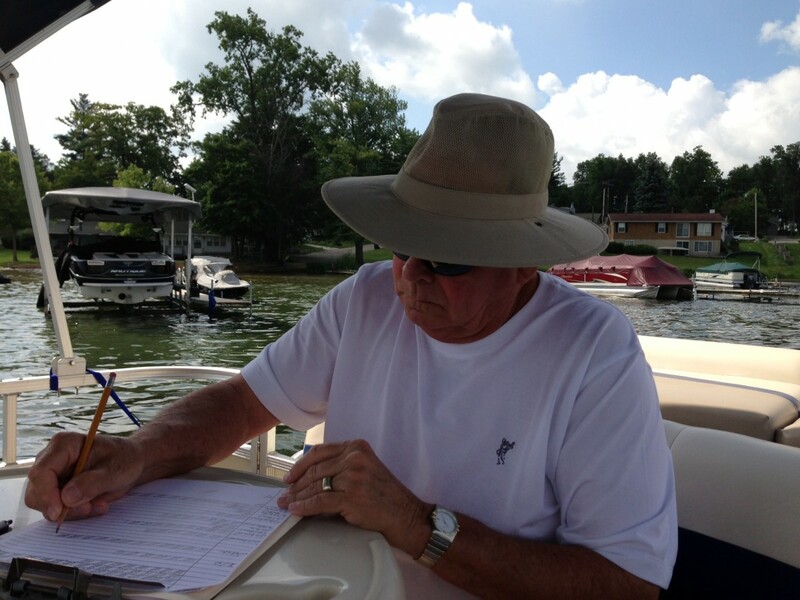 Bowser Eagy started the boat count in 1959. 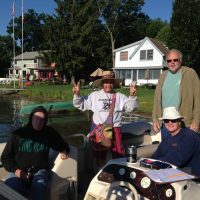 The data between 1960 through 1986 were lost, but the spreadsheet below provides lots of detail and insight into the cyclical popularity of different watercraft on the lake. Entering into the methodology are these assumptions. All boats that are going into the lake for the summer are in the water by July 4th. Most boats counted must actually be moored at a dock, but there are some exceptions. Kayaks and paddle boards are sometimes parked on lawns or decks. 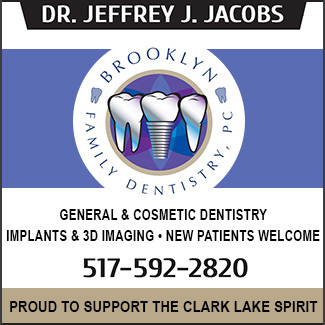 If they can be viewed from the lake, they are counted. Some sailboats on trailers at the Yacht Club are regularly in the water during the season. The boat count crew relies on the Yacht Club to indicated which of those boats should be counted. Some adjustments were made to the spreadsheet. Jet skis and rafts are now included under “total powered.” The other two major categories are “sailing” and “people-powered craft.” The “other” category this year includes one experimental seaplane. By today’s official Clark Lake boat count, the total number of boats on the lake beat all records. Last year’s total showed 1,590, and this year’s total is 1,653. Rafts have a commanding lead, and they are up 4%, from 583 to 607. Inboards have increased 8% and now number 86. This is significant in that these are high ticket items, as are some of the newer rafts. People-power crafts are up 4% from last year. While kayaks beat all other people-power craft, they are down 5%. Paddle boards increased 25% and paddle boats, 28%. Paddle boards didn’t show in the boat count until 2014, and there are now 91 of them at the lake. The number of boats per cottage has increased to 3.6 from 3.5. Since 1987, the low year was 1999. The percentage of of boats moored at the clubs is about the same. 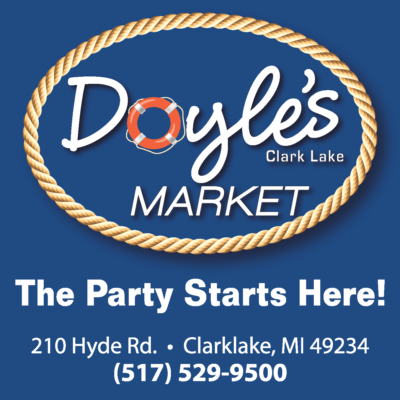 The Clark Lake boat count traditionally occurs on July 4th, with the assumption that any boat that is going in the water, will be in the lake by this date. 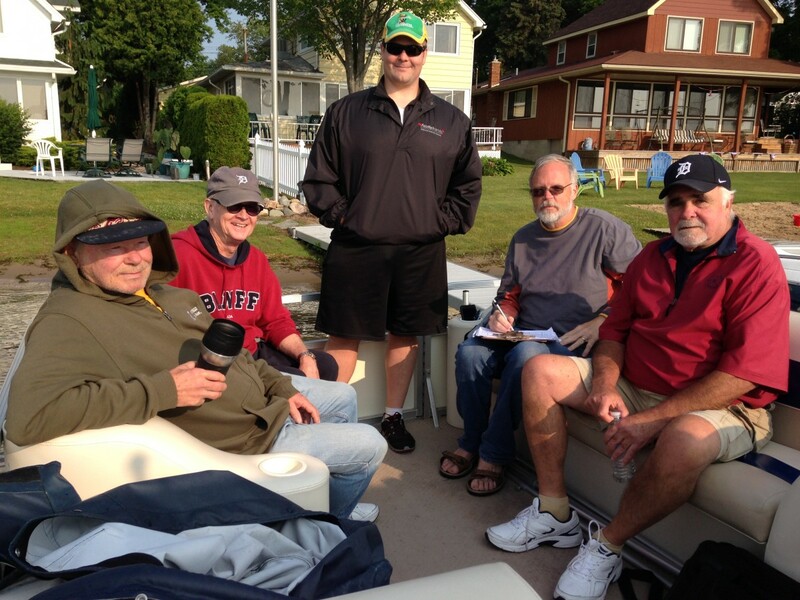 Bill Tuttle leads the crew–Steve Wawro, Lance Hollner, Jim Tuttle, and Rick Belcher. 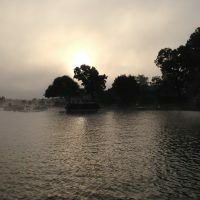 At sunrise, the crew departed from Kentucky Point and followed the shoreline around the lake. 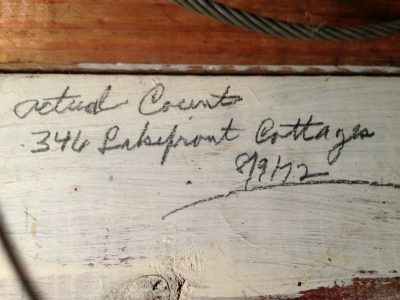 The boat count was initiated by Bowser Eagy in 1959. Data from 1961 thru 1986 are missing. 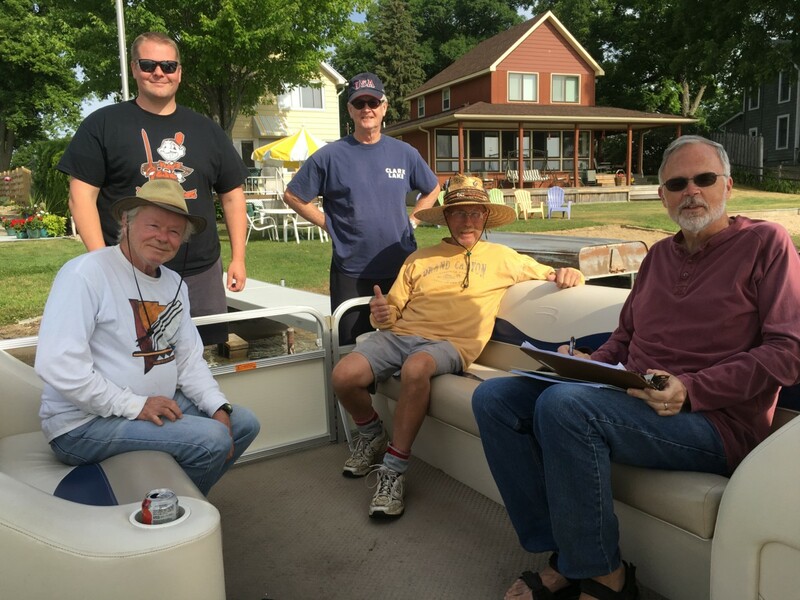 For the last 58 years, a crew counts the number of boats on Clark Lake. The 2016 boat count occurred in the early morning hours of today (Sunday, July 3rd). The timing assures that all boats going into the lake have gone in by this date, on or about the Fourth of July. It also begins at sunrise before boats leave the docks. The boat count as been under the command of Bill Tuttle since 1987. 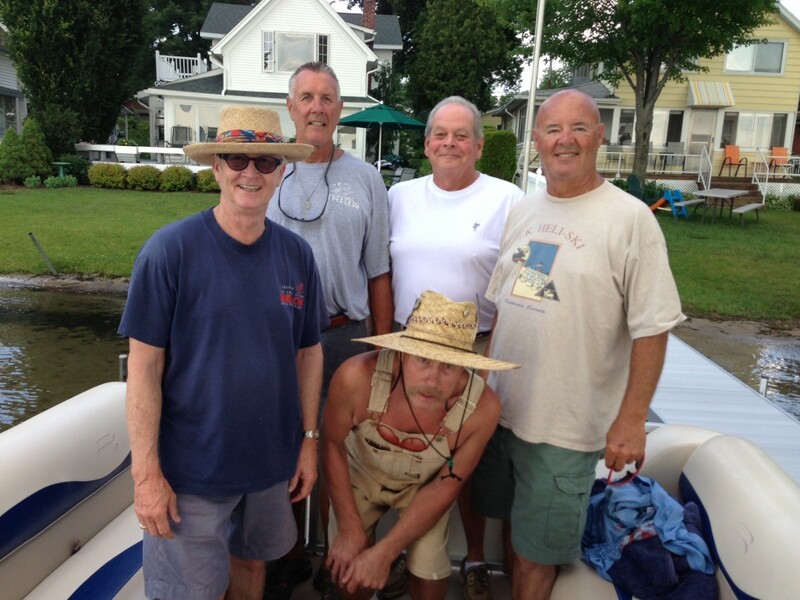 Bill was assisted today by Bill’s brother, Jim, Steve Wawro, Lance Hollner, Jim Bretes and Rick Belcher. The video below shows Bill Tuttle piloting the raft, calling out the numbers to Steve Wawro. Here are the key takeaways from today’s count. There are more boats than ever on Clark Lake–1,590 compared to 1,486 last year. The increase was due primarily to more people powered craft–paddleboards (38 in 2014, 65 in 2015, and 73 this year) and kayaks (226 in 2015 to 292 this year). Rafts continue to dominate, but increased only by one this year to 584. The number of power boats, jet skis, and sailboats (including Hobies) all increased over last year. Of the marinas, the Beach and Boat Club continued to have the most boats at its docks at 121 and is up from 116 last year. Eagle Point came in second at 113, as it did with last year’s 101. 24% of the boats on the lake are moored at one of the clubs or marinas. Bowser Eagy conducted the first boat count in 1959 and continued until 1986. After his passing the statistics between 1962 and 1986 were not preserved. 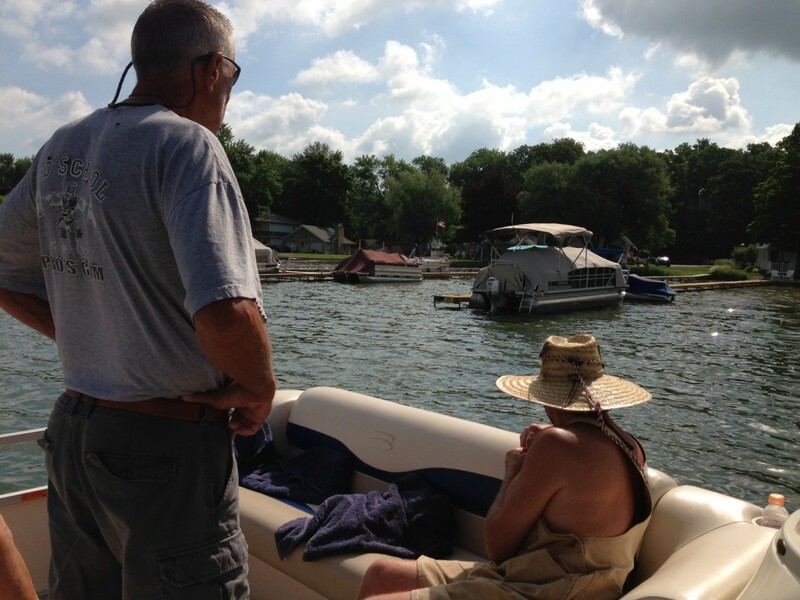 Following the path of a longstanding tradition, the 56th annual Clark Lake Boat Count took place this Fourth of July morning. The count started by dawn’s early light at 6:12 am and concluded at 9 am. Bowser Eagy started the tradition in 1959. Bill Tuttle has been its captain since 1987. The video shows Bill Tuttle piloting the count raft and calling out the boats. The crew helped by spotting and identifying types and transferring the count to paper. The purpose of counting boats is to detect changes and trends. This year some of the previously established trends remained in place. The total number of boats is at a record high–1,468 up from 1393. Another trend is intact regarding the watercraft which was born on Clark Lake–the motor powered raft. 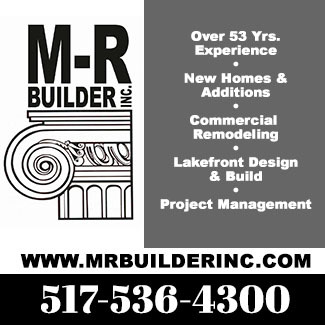 There are a record number of rafts on the lake–583, up from the previous record of 562 in 2014. A surprise was the big jump in the number of inboards, which had been fairly consistent over the last few years. This year’s total was 82, up from 65. Inboards are different from I/Os (inboard-outboards). Their number is down from 128 to 104. Personally powered craft continue their upward climb. The number of kayaks grew from 193 to a new record of 226. Paddle boards were first counted last year, and their numbers increased from 38 to 65. In 2014 the number of Hobies shot up from the 2013 count of 24 to 38. The surge was due in large part to the Fleet 58 Reunion and Regatta. This year, 33 Hobies were counted, down slightly. It should be noted that some of those Hobies in the competition were pieced together for the event and may now have reverted to their former status. 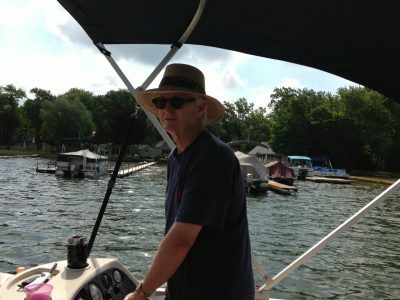 The total number of sailboats on the lake was down slightly to 88 from 90 last year. Here’s a detailed look at the numbers. 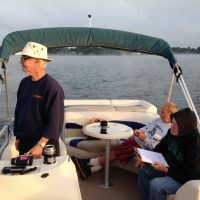 Compared to last year, the weather this morning for the boat count crew was more welcoming. Last year fog covered the lake, and that created some difficulty. This morning, the crew had company on the lake from a couple fishing boats and several skiers. Some of the skiing included barefooting on the lake’s mirror like surface. An excellent reason to conduct a Clark Lake boat count each year is that things change. And 2014 is no exception! The total number of boats on Clark Lake is greater than it has ever been—1,393. 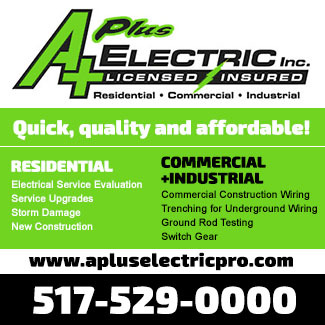 That exceeds the previous high water mark of 1,312 in 2012. Last year the number was down to 1,254 only to bounce beyond previous highs in 2014. Rafts still own the lake. The count reveals 562, up from 523 last year, and exceeding the previous high of 556 in 2012. It’s interesting that Clark Lake has fewer powerboats of various kinds than it did in 1960. In that year, the total was 436—in 2014, 276. Could it be that people prefer the ease of their increasingly luxurious rafts over racing around the lake in a speedboat? The number of outboards, inboards, and jet boats declined. There are more inboard-outboards (I/O’s) this year—128, but that’s less than the peak in 2005 of 172. The number of fishing boats increased to 36, but a whole lot less than the 169 recorded in 1967. Jet skis grew in number (130), though that’s a long way from the peak reached in 2005 (196). There are two big gainers in the personally-propelled watercraft section. Kayaks continue to multiply like Clark Lake chipmunks—164 in 2013 to 193 in 2014. Kayaks have never dipped from one year to the next so that the upward trajectory remains intact. A new category enters this year’s count—paddle boards. It’s not that paddle boards haven’t been seen on the lake before, but the current iteration is new to the Clark Lake scene. These paddle boards make it easy (sort of) to stand and paddle and even do yoga or acrobatics on them. The 2014 count reveals 38 of them. The number of sailboats went from 41 last year to 51 this year. The 2013 count showed 24 Hobie Cats. That grew to 38 this year, perhaps because of the Fleet 58 Reunion and Regatta. The number of sailboats in the water at the Clark Lake Yacht Club is 36, but there are 22 more on dry dock on trailers. The Yacht Club indicates that those do into the lake. So there are times when the number of sailboats on the lake gets a boost. More swim rafts follow the shoreline with the highest number ever of 30, up from a previous high of 26 in 2006. It’s interesting to compare the number of boats moored at the various clubs to the number at the docks of individual residences. 26% of Clark Lake’s boats are moored at clubs, about the same as last year. This percentage depends a lot on the number of lakefront homes—the number used in this calculation is 350. The number of houses likely will continue to decline as lots are combined–with smaller structures coming down and fewer larger structures replacing them. This will certainly affect the percentage in future years. There are 2.9 boats per house, and that’s up from 2.7 in 2013. The total number of watercraft at the clubs is larger than ever—367 in 2014 compared to the previous high of 356 in 2012. 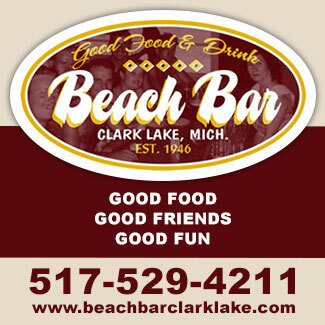 The biggest number is at Eagle Point, followed in this order–the Beach and Boat Club (Consumers), the Clark Lake Yacht Club and the Beach Bar. Because rafts once again are number one, here are some breakouts about where they live. There are 90 rafts at Eagle Point, 59 at the Boat and Beach Club, 59 at the Beach Bar and 1 at the Yacht Club. The other 353 are moored at individual residences. The boat count on July 4th started at 6 am. 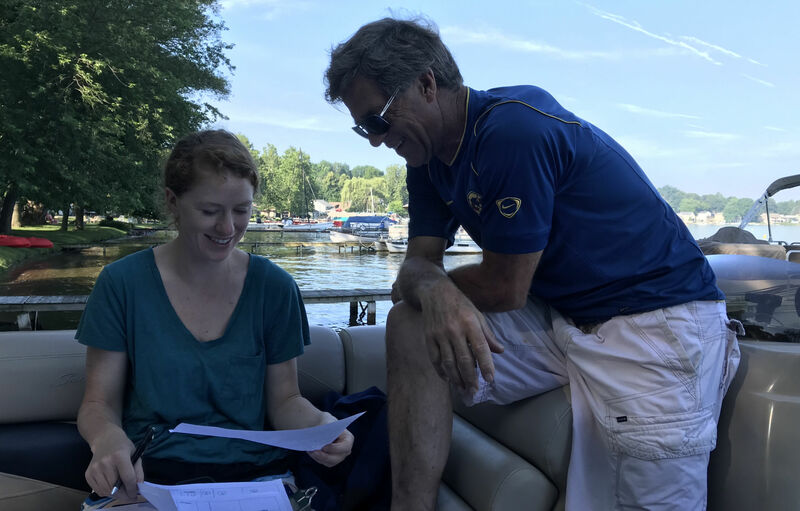 The count is traditionally taken on July 4th with the presumption that all boats that are going in the water for the season are moored at docks or the immediate shoreline, by this date. And at 6 am, the vast majority of boats are not in use, promoting a more accurate count. The weather on the Fourth offered a special challenge. 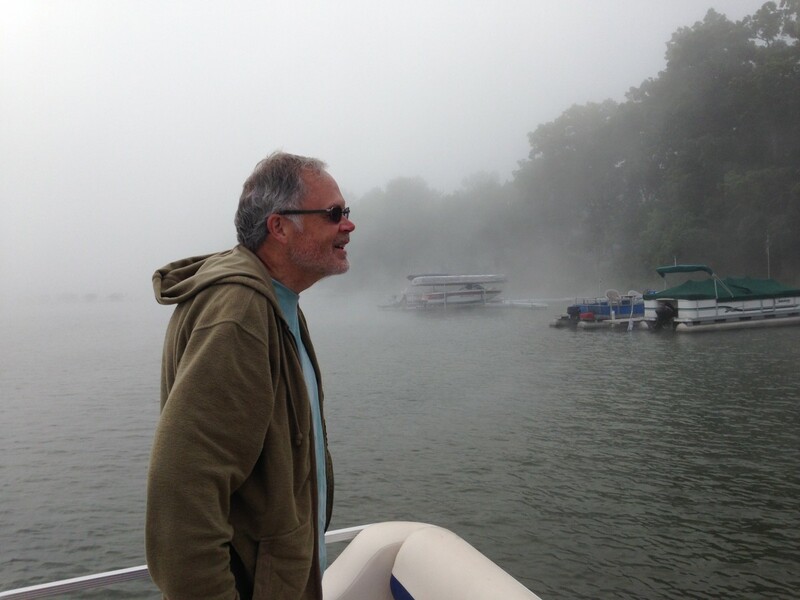 It was not only chilly (in the low 50’s), but foggy, especially in the cove on the east side of Eagle Point. But the crew was determined to take an accurate count. Since 1987, Bill Tuttle has conducted the count. He took over after Bowser Eagy’s passing. Bowser’s data from 1961 to 1986 are missing and have never surfaced. Assisting Bill for this year’s count were Jim Tuttle (Bill’s brother), Steve Wawro, Jim Bretes and Rick Belcher. Frank and Josie Hones conducted the count in the Pierce’s Bay area. 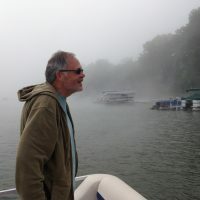 Hugh Harris provided the data for the boats at the Clark Lake Yacht Club. Once again rafts own the big number even though their numbers are off slightly from last year. The upsurge in kayaks continues unabated with every year since 2002 showing an increase. Since 1987, Bill Tuttle has conducted this count. 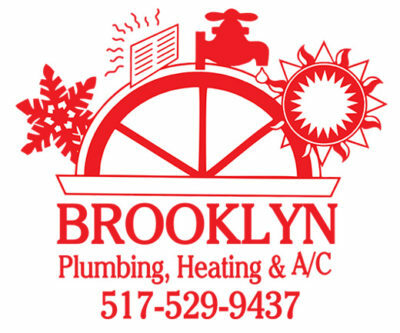 To get a handle on the mechanics of the count, scroll below “highlights” on this page. For every data detail imaginable, download (or look at) the available charts. But we recommend that you start with the highlights. Click Here to Download Complete Boat Census in Excel format. Click Here to Download Complete Boat Census in .PDF format. The total number of boats this year is 1254, that’s down from last year (1312) and down from the peak year of 2008 when 1350 were counted. In 1960 there were only 713. Between 1960 and the next available count in 1987, the number grew to 1178. (Counts from 1961 through 1986 are no longer available. Please see the explanation near the end of this post). Rafts dominate with 523, that’s down from the all-time high of 556 in 2012. The low number was 1960 with 222. 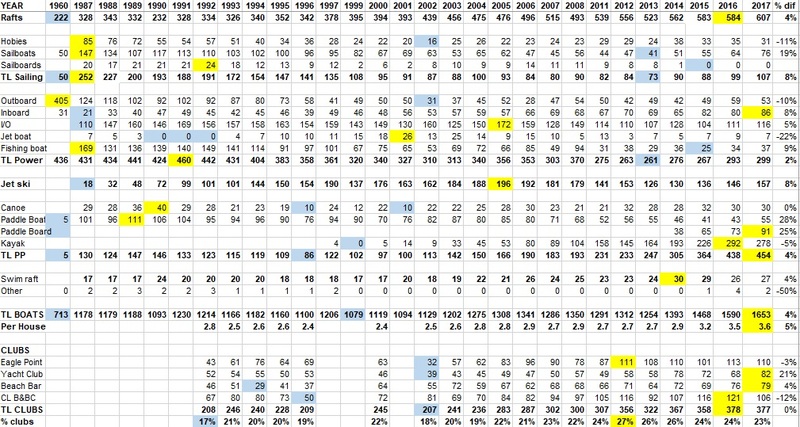 Since 1960, raft numbers climbed even though some dips occurred along the way (such as 1990 when 232 were counted). The big story is kayaks. This year is their best ever showing with 164 counted. They got their start on the lake around 2000 and have multiplied like Clark Lake chipmunks ever since. Because of kayaks, all person-powered craft (canoes, paddle boats, kayaks) came in with their strongest showing this year (247). Over the years, the number of canoes has varied, but there are no apparent long term trends. 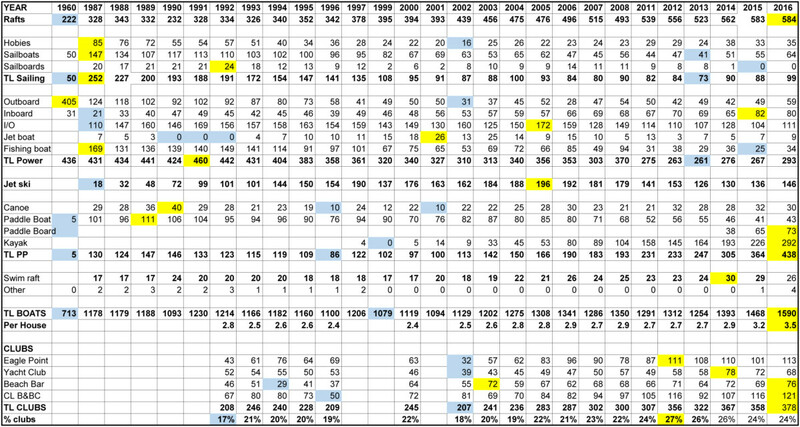 There were 29 canoes in 1987, 40 in 1990, 10 in 1996 and 2001, 28 in 2013. Paddle boats peaked in 1989 (111) and have declined steadily ever since. This year they came in at 55. The largest count of all sailing craft was recorded in 1987 with 257, and it’s down to 73 this year. 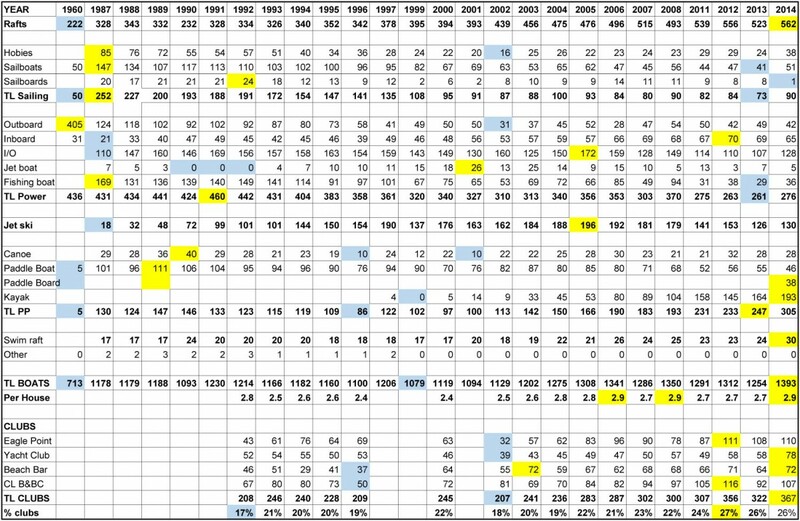 Hobies also peaked out in 1987, and other sailing craft been decline for years. Outside of 1960 (50), this year’s count showed the lowest number with only 73. Regular sailboats peaked at 147 in 1987 and are down to 41 this year. 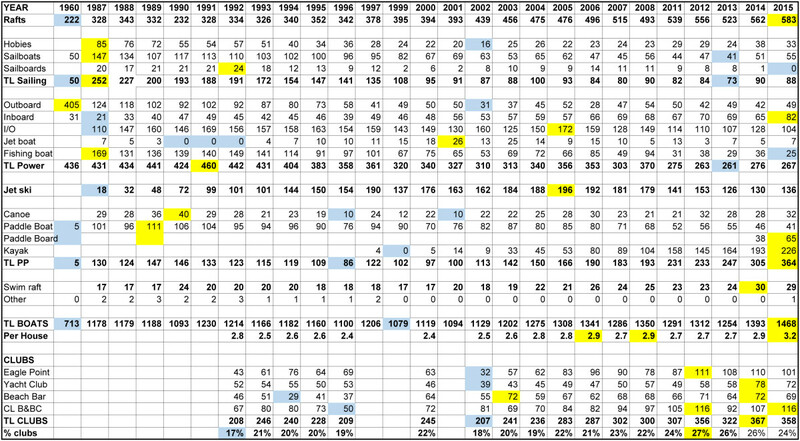 There are 24 Hobies this year, down from 29 last year but up from a low of 16 in 2002. In the early 1980s Clark Lake’s Hobie Cat Fleet 58 was the second largest fleet in the world for an inland lake (second only to an inland lake in South Africa). The remaining motor powered crafts reached a peak in 1991 (460) and touched a low this year with 261. Today, the most motor powered crafts are inboard-outboards (107) followed by inboards (69). Having reached a peak of 196 in 2005, jet skis declined to 126 this year. There are about 365 houses on the lake. Using this number as a base, the largest number of boats per house were counted in 2006 and 2008 (2.9 per house). This year there were 2.6 per house. The long-term trend shows a rise of boats docked at clubs compared to boats docked at houses. The total number of boats at clubs is 322, down from a peak of 356 last year. This year 26% of all boats were docked in clubs, about the same as last year (27%). The lowest percentage docked at clubs was 17% in 1992. This is the 55th annual boat count. Traditionally it takes place at 6 am on the 4th of July under the theory that most boats that would be in the water were in the water by then. 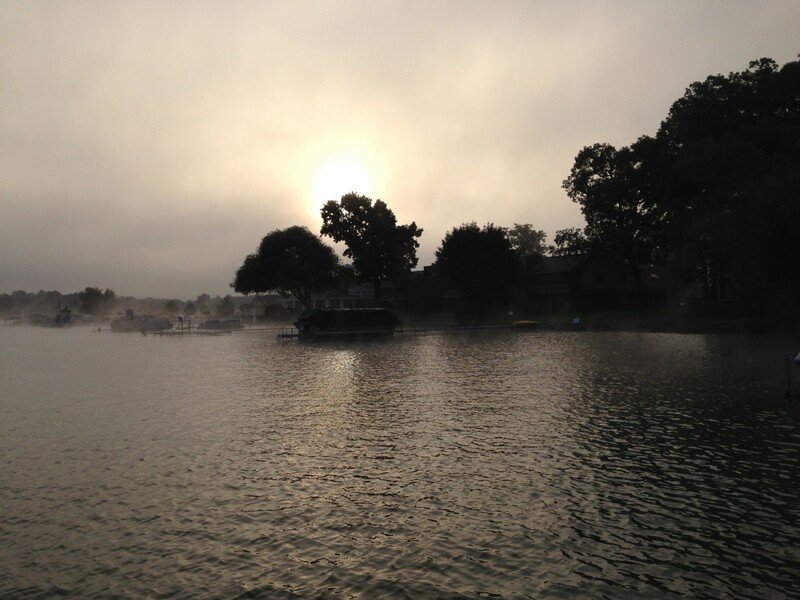 At 6 am most boats would at their dock rather than on the lake. 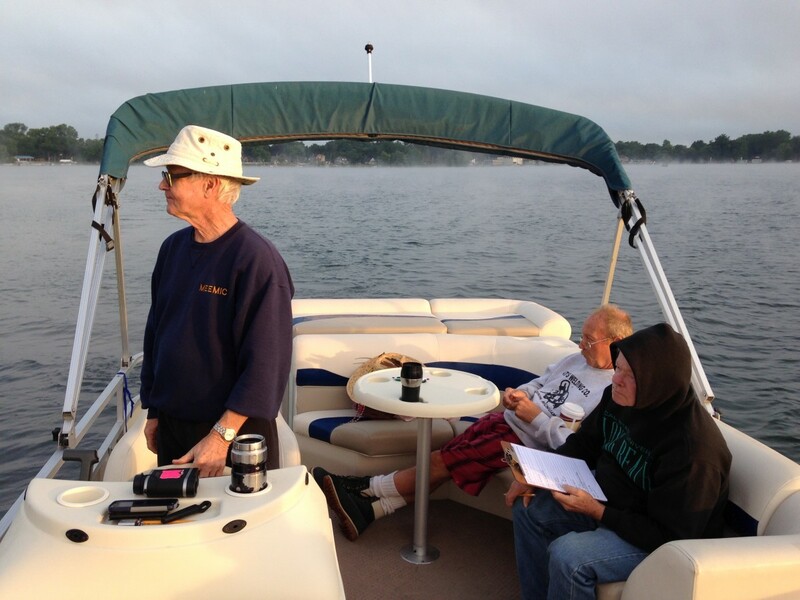 As always, Bill Tuttle was in charge of the crew that circled the lake. 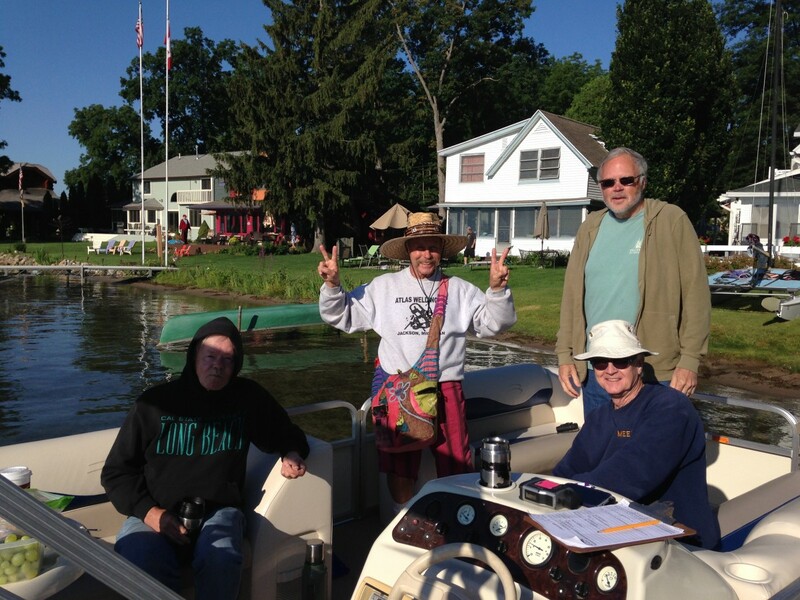 Bill captained the raft, Mike Beebe was scribe, Joe Rumler called out the numbers as the crew passed by each dock. Jim Bretes and Mike Hendges assisted. Because of extreme shallow water, the count of boats in Pierce Bay was done by canoe courtesy of Josie and Frank Hones. The history of the count goes back to 1959. For years, it was conducted by Bowser Eagy. After his passing, Bill Tuttle took up the mantle. Unfortunately the counts from years 1961 to 1986 were lost forever when Bowser’s estate was processed. If you look over the chart in Vital Statistics, you’ll also notice that 2009 and 2010 are missing. Bill Tuttle now says that he has discovered that chipmunks ate the data for those two years. And in support of that story, there are a lot of chipmunks residing here. Bill has, however, discovered an iPhone app that is supposed to recover data from errant animals. We’ll see if it works. 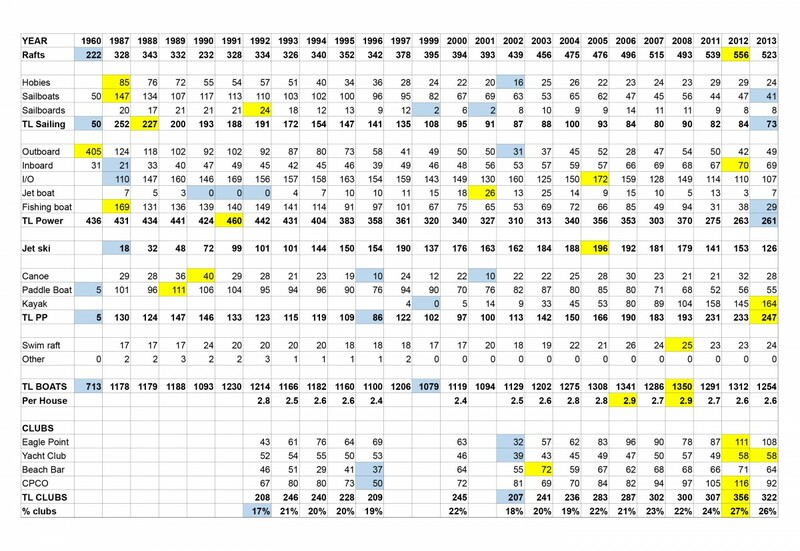 The number of boats per house was calculated by subtracting boats docked at clubs from the total number and then dividing by 365. The 365 number is seen to be fairly consistent year-to- year. But reaching back to the early 70s, there were fewer lakefront structures. On August 9, 1972, Bill Ligibel counted 346 lakefront cottages.